More social media based dramfotainment you say? Well allow us to gladly oblige with our triumphant teeming throng of Tweet Tastings. We’re absolutely thrilled to announce that on June 7th, we’ll be teaming up with our good friends at The Balvenie, for a very special event celebrating the launch of the second instalment of The Craftsmen’s Dinner. The online series hosted once again by renowned Michelin starred chef, Michel Roux Jr, celebrates modern day artisans from urban bee keepers to experimental cheese makers, each using traditional techniques to create their products in the most unexpected of places, from a rooftop overlooking The Shard to a council estate in Tottenham. 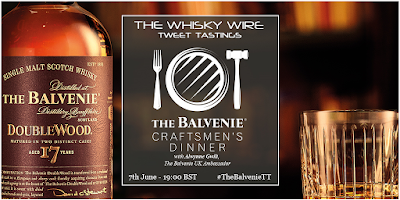 As part of the Craftsmen’s Dinner Tweet Tasting, not only will we be sharing, sipping and savouring a trio of Balvenie expressions, we’ll also be pairing them with some of the food from the artisans featured in the series. We’re also delighted to announce that on the night, we’ll be joined by The Balvenie UK Brand Ambassador, Alwynne Gwilt, who will tell us more about the Craftsmen’s Dinner series, and indeed be on hand to answer all your Balvenie based questions. The closing date to register is May 15th, and if you are registering to take part please make sure that you will actually be free on the evening of June 7th to take part!